Forgive me for my recent lack of posting…I’ve been in mourning. 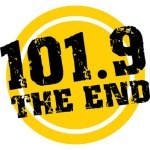 My absolute favorite radio station of all time, 101.9 The End, disappeared off the Salt Lake area airwaves last Wednesday. I had less than an hour of notice before the last songs of Utah’s Rock Alternative played. I’m a music junkie. I’m a fan of terrestrial radio. I spend ridiculous amounts of time in my car. Good music is a MUST when I drive. Despite my loaded 120 GB iPod, I like me a little sassy bit of radio personality peppered in. I’ve found stations in other states and cities that I’m loyal to (particularly 93.9 The River in Detroit), and thankfully most of them broadcast online. But it was like the air was stolen out of my lungs to have MY STATION lose its DJs and go jockless. And does America need another crappy Gen X radio station? I think not. O dear Grant Ruby, Cort and Chunga, and all the others at The End who made the world a happier musical place, please accept my devoted love to you. I wish you much success to you in the future. You’ve got a fan for life. Now excuse me while I begrudgingly reset the preset stations on my car stereo. UPDATE JANUARY 2011: They’re back on the air!! !